Thriving – Somerville continues to be an exceptional place to live, work, play, and raise a family. Equitable – The benefits and opportunities created by climate action are fairly distributed to all and resources are prioritized to alleviate the unequal burdens of climate change. Carbon Neutral – Somerville will have a net-zero release of greenhouse gases within Somerville’s borders. Any emissions that cannot be fully eliminated will be offset. 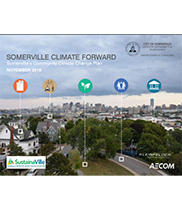 Resilient – Somerville will adapt to be prepared for the chronic and acute impacts of climate change. JSI contributes environmental health and public health emergency preparedness expertise to the climate change adaptation planning process. JSI tasks include supporting integration of social equity, health and wellbeing into climate adaptation goals and informing stakeholders of environmental health and public health best practices for review and incorporation into the climate adaptation action plan. Best practice research draws upon projected local impacts and the evidence of effectiveness in similar settings for combatting climate change challenges such as extreme heat and more frequent and severe flooding. Important frameworks include CDC’s Building Resiliency and Adaptation to Climate Effects and new frameworks focusing on community-driven climate change planning for health equity.